Make room for air to move through. Turn your head away and inhale, deep, through nostrils. Then turn again toward the dark stove and exhale. Aim low, for the coals, but not low enough to stir the ashes. Blow out long and hard until all air is gone. watch for flames to leap. for you, your spouse, your children. Making room for air to move through. Love the imagery this brought to mind this morning. May I tend to the flames in both our fireplace & in my heart :) Blessings! Oh yes. This. This is what I am doing this morning as well, my friend! This is beautiful and so timely -- not just because the weather is getting cold. I definitely need more and better fire for my wet wood. I can hear the crackle and feel the heat radiant on my cheeks. What a beautiful prompt to pray for our loved ones (and ourselves). Making room for the air... I have not tended a fire in so many years that I had forgotten the purpose of moving the logs and making room. It is a purpose from which life can be lived to the fullest. 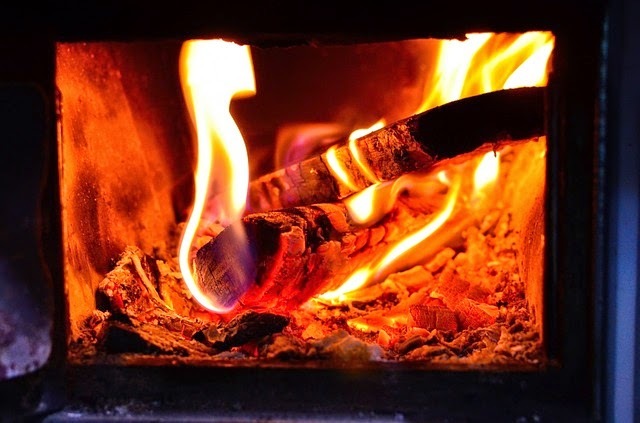 Wanting the flames to rise - for the holy spirit fire to burn bright in my family.One of my most treasured memories is watching my grandfather build a fire in the big fireplace - the process said much about him! Kelly, what a beautiful picture of the Holy Spirit blowing into our lives, re-embering the coals that are cold, heating and igniting the 'wet wood' of our lives.